KINSTON, N.C. (April 10, 2019) - The Down East Wood Ducks took an early lead and never looked back in a 7-0 Wednesday win over the Myrtle Beach Pelicans from Grainger Stadium. In the bottom of the second inning, Pelicans (1-6) starter Alex Lange (0-2), allowed a run on an infield single to Yonny Hernandez. Lange was ejected after 1.1 innings in the loss. Ryan Kellogg took over and allowed a sacrifice bunt for an RBI from the Woodies' (5-2) Eric Jenkins and a Ryan Dorow two-run double to make it 4-0. All runs were charged to Lange. The Wood Ducks added on against Kellogg in the bottom of the sixth inning when Melvin Novoa singled home Diosbel Arias, making it 5-0. Yanio Perez then crushed a two-run homer in the bottom of the eighth to put the game out of reach at 7-0. Tyler Phillips (1-0) was brilliant in his start for Down East, allowing just four hits over his seven innings while striking out four and not walking a batter. Myrtle Beach heads back home next to take on the Fayetteville Woodpeckers in a four-game series on Thursday at 7:05 p.m. The series is the start of a seven-game homestand at TicketReturn.Com Field at Pelicans Ballpark. 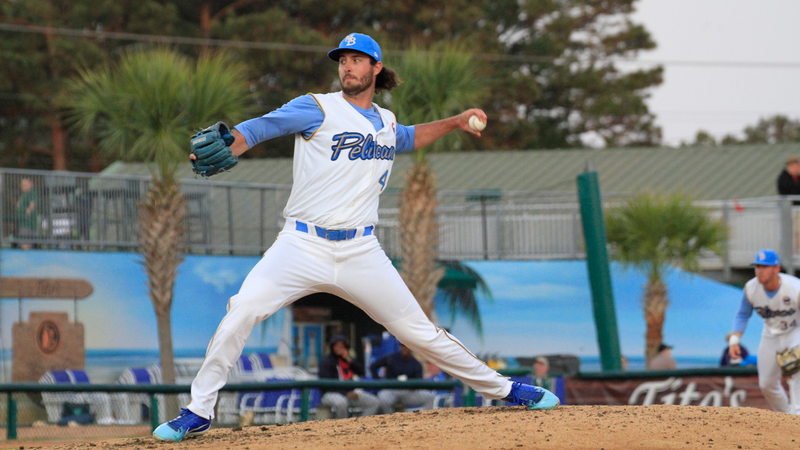 The Birds will send LHP Bryan Hudson (0-0, 3.60) to the mound against Woodpeckers starter RHP Yohan Ramirez (0-1, 6.00). Coverage begins at 6:50 p.m. on MyrtleBeachPelicans.Com/Broadcast and the First Pitch App. Thursday is Thirsty Thursday, presented by Celebrations Nitelife, Axelrod & Associates and Gator 107.9 FM, with $1 Bud and Bud Light drafts, $2 16 oz. cans and $2 Duplan wine from 5:30 p.m. until 8 p.m. After the game, fans can enjoy a Postgame Fireworks Extravaganza brought to you by East Coast Pyrotechnics.